Anchorage? AK. ©Aug., 2005. Photo by John Combs. ADA Features: Wheelchair lift to lower level, 1 restroom. Will have lift to dome level added in 2006. Princess’ cars operate in five car sets, lettered A through E, in order. They are arranged so the location of kitchens and dining rooms makes serving meals easier and more efficient. Princess’ cars operate at the end of the Alaska Railroad’s Denali Star passenger train between Anchorage and Fairbanks, AK. Cars 7084 and 7085 are designated as E cars. They were built in 1992 or 1993 (exact dates aren’t verified yet) at Rader Railcar’s plant in Denver, CO. The kitchen is on the trailing end of the car, with the dining room at the front, adjacent to the dining room in the D cars, 7088 and 7089. There is a small observation platform on the trailing end of the car. Like the other cars in the Princess fleet, the 7088 and 7089 seat 88 passengers upstairs, and 32 in the dining area. 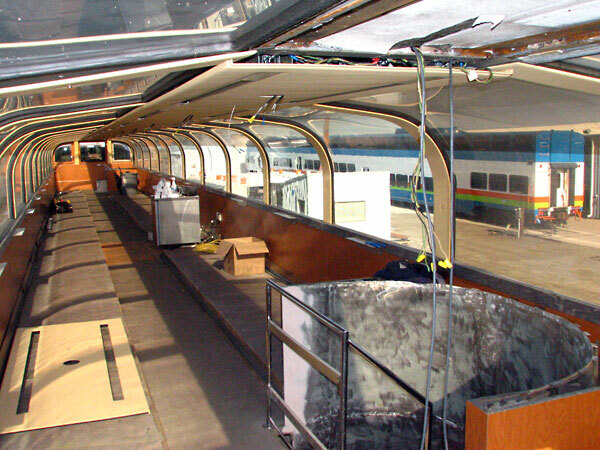 The E cars will receive a general refitting and renewal during the 2005-2006 winter off-season, which will include new interior upholstery, seating and décor, and new exterior paint. Another important key to that refitting is the upgrading of the ADA accessibility. Presently, the E cars feature a hydraulic lift to get ADA passengers from the ground onto the lower level, and an ADA restroom. During the refitting, they will receive lifts to the dome level, and ADA seating upstairs.